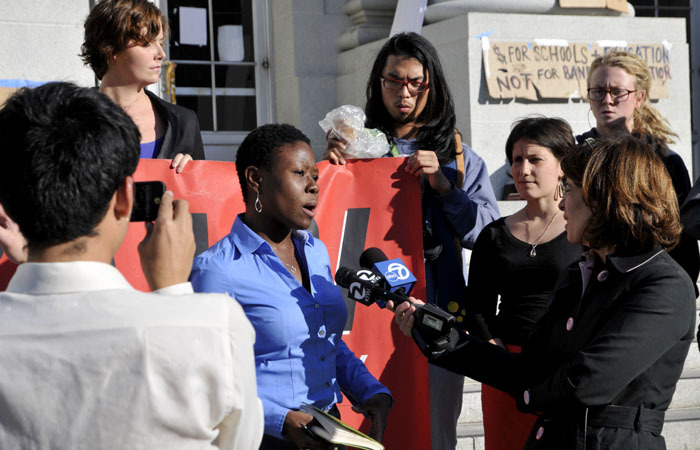 BAMN attorney Monica Smith spoke at Monday afternoon's press conference, where it was announced that a civil suit will be filed against UC Berkeley. Fourteen of the protesters who attended Wednesday’s Occupy Cal demonstration have agreed to file a civil suit against UC Berkeley and UCPD, as well as the Oakland Police Department and Alameda County Sheriff’s Office. Attorneys for BAMN, a national pro-affirmative action group, intend to file the lawsuit by next week on behalf of protesters who either experienced violence or were arrested despite claims of remaining peaceful at the demonstration. The group held a press conference on Monday afternoon on the steps of Sproul Hall to announce the lawsuit and call on Chancellor Robert Birgeneau to resign. “We are not going to let the police, this university, this city or this state get away with brutalizing and taking away the First Amendment rights of student protesters,” Smith said. Yvette Felarca, a UC Berkeley alumna and the Northern California organizer for BAMN, who spoke at the press conference, was featured prominently in the viral YouTube video highlighting the violence that occurred on Wednesday and would be a plaintiff if the case is filed. “The treatment that we received for taking a stand in a peaceful protest … were blows, bruises, cracked ribs, injuries, being beaten in the head and stomach, and we are all very lucky that the injuries we sustained weren’t worse,” Felarca said. At the press conference, eight students gave testimonies of their experiences with police on Wednesday. Each had similar stories of being physically assaulted but different reactions to the pain they described. UC Berkeley graduate student Alex Barnard gave an account of how jabs from police batons fractured one of his ribs. He said that when he put his hands up and asked to be arrested to stop the beating, he was thrown to the ground. Ferlarca said the police’s actions did not scare students away from Occupy Cal, instead galvanizing them to add their support to the movement.